You ready to have your mind blown? Great. Because TheWrap has a theory about what the theme is for “American Horror Story” Season 8, thanks to a clue Ryan Murphy dropped Friday and a little help from Reddit. And it’s explosive. That statement was made during a pre-Emmy voting “for your consideration” panel Friday night in Los Angeles: April 6, 2018. That means if we’re taking Murphy literally (which we should probably never do, but what the heck) we’re looking at October 6, 2019. According to The Hollywood Reporter, the creator then encouraged fans to do a little digging to figure out exactly what is going on a year and a half from now. So they did, while also taking into consideration the title circulating the internet, “Radioactive.” And it looks like one of them may have found the answer, if not taken a very solid step in the right direction. And, uh, according to Politico, this user is right. On Oct. 6, 1961, President Kennedy advised citizens to build bomb shelters to protect themselves in anticipation of possible nuclear war with the Soviet Union. Kennedy also said the government would begin providing this protection for all Americans. “There is need for a nationwide understanding of what each level of government, each private organization and each citizen can do to bring about and maintain the best attainable protection for the civilian population against the major effects of a thermonuclear attack,” JFK said in the speech, given one year before the Cuban Missile Crisis. Now, the only mix up here was the user’s use of the title “Nuclear,” rather than “Radioactive.” However, we don’t even know for sure that “Radioactive” is the right label for Season 8 — though 20th Century Fox did file a trademark application with the USPTO for the title “American Horror Story: Radioactive” on March 6. So does that mean Murphy is putting his favorite group of actors into a not-so-distant future where America is either about to, or already has, gone to nuclear war? It seems like a definite possibility right now. Well, about as definite as anything ever is with Murphy. The showrunner himself wouldn’t confirm or deny the “Radioactive” title last night when asked. But he did give out a few more details about the season, including that “it’s heightened” compared to the last season, “Cult.” “It’s not necessarily as real and grounded as the past season. We’re sort of getting back to ‘Asylum’ and ‘Coven.’ That’s the tone of it,” he said, according to THR. Murphy also doubled down on his announcement from earlier in the week that Joan Collins had been added to the cast. As of Wednesday, a representative for the actress told TheWrap she was still in “final talks” for a leading role. 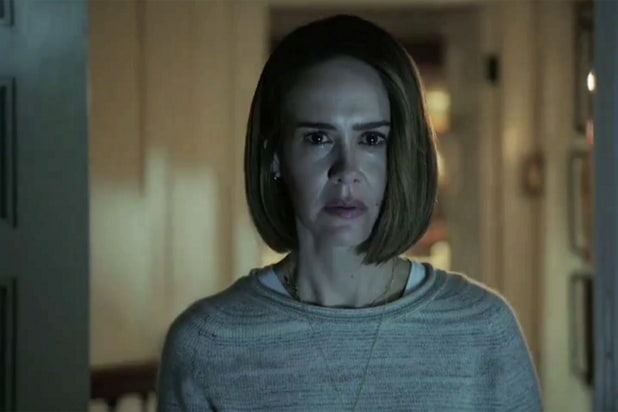 Previously announced leads are “AHS” staples Sarah Paulson, Evan Peters (who Murphy revealed Friday will be playing a comedic hairdresser and Collins’ grandson) and the returning Kathy Bates. Representatives for 20th Century Fox, FX and Murphy did not immediately respond to TheWrap‘s request for comment on the season’s title or theme. Starting with the election of Donald Trump, Kai has been executing an elaborate plan to gather followers and remake America as he sees fit. It started with a group of people dressed as clowns committing murders around his small Michigan town. Now, Kai is preparing to take the movement national, and learning some lessons from past cult leaders. Episode 7 of "American Horror Story: Cult" used extended flashbacks to tell a fictionalized account of Valerie Solanas, the woman who shot Andy Warhol. Solanas' plan in the episode to encourage women to kill all men never really took off, and Warhol -- played by Peters -- eventually got the last laugh. The founder of the real Heaven's Gate cult and his followers believed their souls could evacuate Earth to meet a spaceship in the tail of the Hale-Bopp comet. Applewhite used the early Internet to gather followers and left a bunch of strange videos after he and 39 Heaven's Gate cultists committed suicide in 1997. In "American Horror Story: Cult," Peters plays Applewhite to recreate some of that video footage. Koresh and his followers, a real cult of former Branch Davidians, believed he was a prophet. As a cult leader, Koresh took multiple wives and he and his followers stockpiled weapons. That attracted the attention of the ATF, and its attempt to investigate the group's Waco, Texas, compound turned into a siege, and then a deadly raid and fire. In "American Horror Story: Cult," Peters' Koresh starts the fire that, in reality, helped to kill more than 80 of his followers. Kai calls Jones "the Kanye of cult leaders." The real leader of Jonestown, a commune in Guyana, was responsible for the deaths of more than 900 of his followers after convincing them, or forcing them, to drink Kool-Aid mixed with cyanide. Peters portrays Jones in the story Kai tells on "American Horror Story: Cult," in which the leader really did rise from the dead to save his followers. Peters also has another role to play in Kai's version of the Jonestown Massacre. He appears as a low-rent Jesus, descending (on obvious wires) from the heavens to resurrect leader Jim Jones and help him save his people. It's telling that young Oz (Cooper Dodson) is the only one who calls BS on the story. We haven't seen the notorious Manson Family leader on the show yet, but we know he's coming. Creator Ryan Murphy teased the Internet with a shot of Peters as Manson in October. 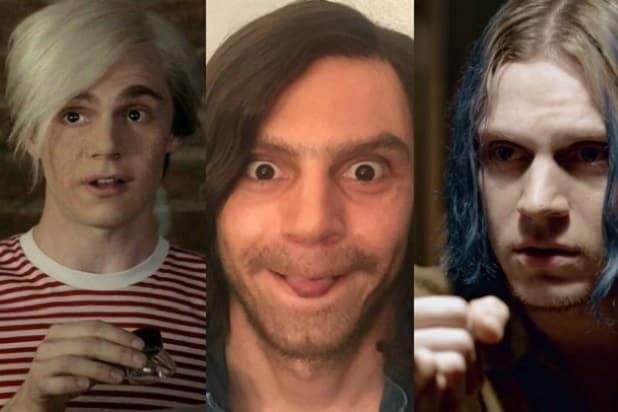 It's a fair bet it'll be Peters' creepiest role on "American Horror Story: Cult," going by this image.